August 6, 2018 5:00 P.M.
Also present were Rich Simon – Director of Public Works, Dustin Bedore – Director of Electric Utilities, Joni Showalter-Police Chief, Suzanne McClure – Economic Development Director, Alex Weis – Code Enforcement, LeAnn Taylor – Municipal Court Clerk/Judge, Mary Volk – City Clerk, and Andrew Finzen – City Manager. Unfit Structure: 418 E. 17th – Mayor Linin opened public hearing at 5:00 p.m. Mayor Linin stated, the property owner has talked to me about the building. The roof is caved in but unsure what his plans are for the building. Mayor Linin closed hearing at 5:01 p.m.
Unfit Structure: 615 W 13th – Mayor Linin opened public hearing at 5:01 p.m. There was no public comment so Mayor Linin closed hearing at 5:02 p.m.
FY 2019 Budget – Mayor Linin opened public hearing at 5:02 p.m. There was no public comment so Mayor Linin closed hearing at 5:03 p.m.
Goodland Swim Team: Shauna Johnson – Shauna Johnson, Goodland Swim Team Coach stated, the team did well, brought home league again. We have five coaches for forty-five swimmers. We would like to thank the Commission and let City know we realize they go above and beyond to help team. We would like to thank Barb Bedore and pool staff for help guarding during practices and at meet, Rich and staff for bringing us equipment needed for meet and Dustin and staff to ensure adequate electric to buildings. We had two hundred swimmers at our meet, which brings a lot of people to our community. GRMC Update: Chris Smolik – Absent, no presentation. Community Art Walk Plans: Abby Killingsworth – Abby stated, this is third annual art walk. We received funding from Sherman County Community Foundation and requesting permission to use Chambers Park for most of event. The event begins with a walk/run beginning at VanGogh parking lot. There will be a free hot dog feed in park and we are allowing vendors in park to sell handmade goods. Other committed partners for event are NWT College, Public Library and High School Art Club. We have designed cross walk art to paint three cross walks in town. We would like to do temporary public art in the walks that will last about a year. The cross walks we would like to high-lite are on Cherry Street from VanGogh to Pioneer Park, from Topside Trail to Museum and the crossing at 13th and Center. Designs are from the old telephone building. Commissioner Fairbanks asked, will the City block off streets to facilitate painting? Abby stated, I have talked to Kenton about process City uses and will continue conversation. ON A MOTION by Commissioner Fairbanks to allow Art Walk in park and for the Art Center to design paint the three cross walks as stated seconded by Vice-Mayor Brumbaugh. MOTION carried on a VOTE of 4-0. Nex-Generation Summer Internship: Suzanne McClure – Suzanne stated, Kinsey Volk was my summer intern funded through Nex-Tech Wireless and Nex-Generation. Her last day was today. Interns are sponsored to companies in northwest Kansas that apply for funding. I would like to thank you for allowing me to have an intern. She has done a good job getting visibility on our social media. We submitted a video of her experience to complete internship. Suzanne played video for Commission. ON A MOTION by Vice-Mayor Brumbaugh to approve Consent Agenda seconded by Commissioner Schields. MOTION carried on a VOTE of 4-0. Ordinance 1714: UPOC 2018 – LeAnn summarized changes in UPOC for the Commission. LeAnn stated, we recommend approval with the exception of Section 9.9.1 and Section 9.9.2 as published in book form by the League of Kansas Municipalities, Topeka, Kansas. Cases of this type should continue to go through District Court because of costs involved. Andrew stated, we do not have financial resources or staff for these charges, ordinance is presented redacting two sections. ON A MOTION by Vice-Mayor Brumbaugh to approve Ordinance 1714: UPOC 2018 seconded by Commissioner Schields. MOTION carried on a VOTE of 4-0. Ordinance 1715: STO 2018 – LeAnn summarized changes in STO for the Commission. LeAnn stated, we recommend approval of STO as presented. ON A MOTION by Commissioner Schields to approve Ordinance 1715: STO 2018 seconded by Vice-Mayor Brumbaugh. MOTION carried on a VOTE of 4-0. Resolution 1537: Unfit Structure at 418 E. 17th – Andrew stated, Resolutions 1537 and 1538 designate structures at address stated as unfit and provide property owner thirty days to improve property before they are put out to bid for demolition. Mayor Linin stated, I had a visit from owner at 418 E. 17th who was upset that he was on list. After our discussion I thought they were going to do something with property but now I am uncertain of their intentions. ON A MOTION by Commissioner Fairbanks to approve Resolution 1537: Unfit Structure at 418 E. 17th seconded by Commissioner Schields. MOTION carried on a VOTE of 4-0. Resolution 1538: Unfit Structure at 615 W. 13th – ON A MOTION by Vice-Mayor Brumbaugh to approve Resolution 1538: Unfit Structure at 615 W. 13th seconded by Commissioner Fairbanks. MOTION carried on a VOTE of 4-0. FY 2019 Budget – Andrew stated, we held hearing now have to approve budget. ON A MOTION by Mayor Linin to approve FY 2019 Budget as presented seconded by Vice-Mayor Brumbaugh. MOTION failed on a VOTE of 2-2 with Commissioner Fairbanks and Commissioner Schields casting the dissenting votes. Mayor Linin contacted Commissioner Garcia via telephone in an attempt to approve the FY 2019 Budget. ON A MOTION by Mayor Linin to approve FY 2019 Budget as presented seconded by Vice-Mayor Brumbaugh. MOTION carried on a VOTE of 3-2 with Commissioner Fairbanks and Commissioner Schields. Commissioner Garcia excused himself from meeting. Parking/Garage Ordinance(s) – Andrew stated, we discussed this previously then needed to get through budget season. There have been no changes since last discussion. We need Commission input. Mayor Linin asked, the statement has been made that we have an ordinance in place to enforce this issue. Andrew stated, not if the vehicle is operational with up to date license and registration. We have restrictions in place for inoperable vehicles. Mayor Linin stated, I feel vacant lots should be treated same as residential lots and I am in favor of building garages on vacant lots. My concern is turning into a community with a number of garages. I feel if citizens make the investment to protect belongings they should be able to build the garage. Commissioner Schields asked, are we limiting size of garages? Mayor Linin stated, yes we do; we had Troy Mannis want to build bigger building for equipment as it would not fit in size allowed. Troy stated, the current sixteen foot restriction on height will not work with the doors, probably need to allow eighteen or twenty feet. For my equipment I would like restrictions at least sixteen feet wide and forty-eight feet long. Vice-Mayor Brumbaugh stated, I have no problem with the height as a two story house is higher than that. Mayor Linin stated, we need to think about restrictions as they should be big enough to house additional items. Vice-Mayor Brumbaugh stated, I feel we need to accommodate with restrictions. I know we have language in ordinance for type of material for building. Commissioner Fairbanks stated, I like our modification to require applicant to submit a site plan which reveals external materials so we can insure it looks nice to enhance community. Vice-Mayor Brumbaugh stated, the driveway is where the expense will be for materials required. I feel we need to address residential property separate from vacant lots. Some vacant lots are dirt with all kinds of stuff scattered on property, but it may be alright the way it is written. Would you require a drive with cut of curve in ordinance? Andrew stated, yes we would require a driveway for parking. A vacant lot with a bunch of vehicles stored on is prohibited. Mayor Linin asked, what would be different from a vacant lot and residential property? Alan Langness citizen stated, I am building a garage and need height to match my house. Mrs. Lyle Kimminau stated, it would be no different than people building an apartment above a garage. The height should be allowed. Vice-Mayor Brumbaugh asked, on a vacant lot would we require concrete or gravel beyond cutout if there is not a house on property? Andrew stated, it would have to have driveway area. There would be no front, side or back yard. Suzanne asked, how high can an attached garage attached be? Alex stated, thirty–five feet. Dean Graber asked, what is the difference between a vacant property not having a driveway and property that has a house with alley access? They park on street in front of property since no cuts in curb for driveway. J.J. Howard citizen asked, what size can building be on a vacant lot? Andrew stated, right now 1,200 square feet. Alex stated, house and accessory structures cannot take up more than 50% of the lot. J.J. asked, knowing that, why can they not build a garage on vacant lot that is 50% size of lot? Andrew stated, because there is no future use of that property to be able to build a house. J.J. stated, they would purchase the lots next to the garage to get the garage. Andrew stated, I put this question out on City Manager list serve and received overwhelming response not to allow. A residential zone is for residential purpose, serving residential neighborhoods. With other communities concern I have concern heading this direction. I do not want citizens to put cheapest garage up they can, it needs to be an investment in community that makes our community a cleaner environment. Vice-Mayor Brumbaugh stated, I question if we should allow dirt drives. We have an overwhelming number of properties that have a garage behind the house which will involve a lot of product for drive. It would enhance property and make easier maintenance but if the ordinance is stricter the driveway would be cost prohibitive. Commissioner Schields stated, there are a lot of dirt driveways, I am fine with that, my issue is the vehicles that jump curb and park in the yard. Vice-Mayor Linin stated, the difficult thing for me is the different scenarios that play out. There are property owners that keep property mowed and looking nice no matter what material makes up driveway. Then there are those that do not take care of their property at all. Mrs. Kimminau stated, we bought a car port to accommodate two cars but asphalt driveway is small so we have few feet of dirt along outside edge. Lyle is sick and not sure can afford to put in a new driveway. Vice-Mayor Brumbaugh stated, there are properties where they park in yard even though there is a cut out in curb but does not look like they use driveway at all. Just for aesthetics we need to keep off their yard. This is an economic development issue that does not present well of our community well. Many people who move here notice this; we need to look at the bigger picture to draw people to our community. I do not know if it is engrained in the community because people that live here do not notice, but being an outsider it stands out. We have to compete for the people and we want them here. People do not think about that when they wonder why Colby or Burlington are growing. I do not want people to misunderstand what the issue is, ultimately it will benefit everyone. Commissioner Fairbanks stated, I feel we should begin with a basic ordinance that does not allow parking in yard and not worry about what the driveway is made up of right now. I also feel we need to increase the peak for accessory buildings. We need to have attainable goals rather than a large comprehensive ordinance that includes everything. Mayor Linin stated, I have the same thinking, but there are so many different scenarios. Commissioner Fairbanks stated, I like attainable small steps. It will not make everyone happy but we have to move forward. Vice-Mayor Brumbaugh stated, is it an enforcement issue or not, we do not want the ordinance to be too subjective. If it is vague we will have trouble with ordinance. Mayor Linin stated, I am in favor of something smaller to make small steps, all scenarios are different. Troy stated, the problem I have is people jumping the curb because it tears up curb. Commissioner Fairbanks stated, if they have a cut out that is where you park. I would like to see progress with an ordinance that is small and we can stand behind, then move forward from there. Alex stated, something simple will not work for every situation, it has to be able to be enforced. The definitions have to be clear as to what is a yard and what is a drive way. Andrew stated, the ordinance will not accommodate every situation. Commissioner Fairbanks stated, we are trying to help our community and promote economic development. We want people to move to our community. Many small communities have same type of ordinance. Consensus of Commission is to have Andrew draw up ordinance with such changes. City Managers Report- 1. Offices will be closed September 3rd in observance of Labor Day so Commission meeting will be September 4th. 2. The final day pool is open to the public is August 12th. There will be a couple parties followed by the pooch plunge after that. They are finishing up the extension of road in the Industrial Park then work on next phase on 16th Street followed by curb and gutter on Cherry Street. The street project is proceeding. 4. They are making progress on the airport Master Plan. Hoping to have paperwork finished early October. We have determined the holdup has not been on the part of the City or our consultant but the FAA and changes they require in the review. We are on the right track nearing completion. There has been some supplemental funding open up that is 100% federal funding to redo cross wind runway. We are going to apply and if awarded it would take care of our discretionary funding, but will save us about $400,000. 5. Want to keep sales tax issue in front of Commission. If we want issue on ballot, earliest looking at is primary election August 6, 2019. That requires the referendum call by May 1st so the Commission will need to have a plan. City only levies .25% for school district. The City receives portion of County levy. The first part is distributed to Cities in Sherman County based on population then second part goes to City’s based on property tax levy. City of Goodland’s portion of sales tax has gone down last few years. Cities can assess 2% for general purpose which does not sunset and 1 % for special purpose which has to sunset. 6. 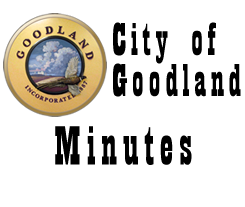 League of Kansas Municipalities (LKM) journal has Goodland in community profile. 7. LKM annual conference is in October if any would like to attend. 8. House numbers are being distributed; we have given out numbers for about twenty-seven properties. Director of Public Power – Dustin updated Commission on what projects Production and Distribution crews are working on. Dustin stated, every five years we are required to complete capacity testing with Sunflower to see that we can run when called on. Last time we tested at 15.1 MW. Unit 12 was put into emergency power only so this year tested at 14.8 MW which is good. Unit 12 was 700 KW unit. For the test, we have to run for an hour in heat. I commend my crew for their work as it is the first time this crew went through experience. Sunflower complimented our plant stating it was the nicest and cleanest plant. Mayor Linin asked, how many MW do we use on an average? Dustin stated, this year summer peak is 12.8 MW and winter is 9.6 MW. We have months where it may only be 5 or 7. Highway 24 project has become a very time consuming project. We need to get back to alley cleanup. We experienced a major outage yesterday which affected entire north loop. We are beginning an apprentice program with three guys. It is a State accredited program that requires a contract of employment. Municipal Judge – LeAnn presented statistics as of August 1, 2017 compared to same time in 2018. LeAnn stated, seat belt violations are higher this year because they have participated in some programs. I have moved my office upstairs to be closer to court room and have a place for attorney’s to meet with their clients. Mayors Report – I have noticed positive things going on for City making our community look sharp. The school crossings have been repainted, parking lot for Max Jones Fieldhouse redone and new LED lights; they all look good. ADJOURNMENT WAS HAD ON A MOTION Vice-Mayor Brumbaugh seconded by Commissioner Fairbanks. Motion carried by unanimous VOTE, meeting adjourned at 7:00 p.m. Next meeting is scheduled for August 20th.